Natural Resources Canada’s Office of Energy Efficiency (OEE) is our federal government’s official body for helping Canadians save energy and money. Its website, http://www.oee.nrcan.gc.ca, has a wealth of information about everything from buying better home appliances to designing better commercial buildings. If you’re a frequent visitor to the site, you may have noticed that longstanding guidelines for idling reduction were modified recently. But there’s something a bit suspicious about the changes. For years, the OEE’s idling reduction programs have been based on the 10-second rule. It’s message is simple: it’s better to turn a car or light truck engine off than to let it idle for more than 10 seconds. It’s a general guideline, so as with any such rule there are exceptions. For example, it’s not recommended that engines be shut off at traffic stoplights – they don’t always start back up when you want them to, and that can create a traffic mess. As well, it doesn’t always make sense in cold winter conditions. But overall, the 10-second rule has been a great guideline for Canadians, helping us save money, fuel and the environment. But back in February, the 10-second rule suddenly disappeared from OEE’s website. In its place was a message indicating that an update was coming soon. Six months later, the long-awaited update has finally arrived. Now it seems that it’s OK to idle longer. Has the science behind the recommendation changed – or is something else at work? A recent CBC news story suggests there’s a bit more behind our federal government’s change of heart. Real science or science of convenience? You see, excessive idling is starting to become socially frowned upon. 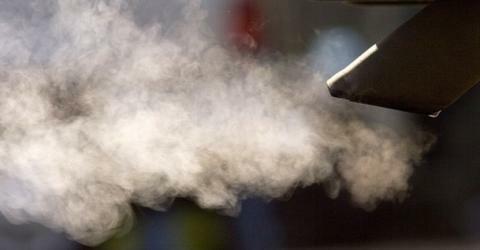 It’s about time, of course – Canadians waste literally millions of litres of fuel every day through unnecessary idling. If we are truly ready to believe the environment is worth taking care of, minimizing our idling is one of the easiest things we can do. Much of our preventable idling takes place at the drive-thru, so fast food restaurants and coffee shops are becoming concerned that a backlash against idling might put a damper on a part of their business that clearly makes mountains of cash. If that CBC story is correct, they have been very busy behind the scenes, working to sanitize the image of their drive-thrus. That sanitization campaign has included sponsoring a study that concludes that going through the coffee shop drive-thru causes no more pollution than parking. It has included publicizing those results using questionable comparisons, such as comparing chainsaws (whose two-stroke engines pollute much more by design) to vehicles at drive-thrus. And it has included pulling political strings to help the study’s conclusions become part of the government’s new recommendations. Could the story be true? There are a few indisputable facts. RWDI Air, an Ontario engineering firm, recently conducted a study on behalf of Tim Hortons that seems to vindicate drive-thru. The study is being widely used to defend them, including by the Canadian Restaurant and Foodservices Association (CRFA), whose membership includes most drive-thru operators in Canada. Then last February, the CRFA met with Natural Resources Minister Gary Lunn, who oversees the OEE – and the 10-second rule disappeared from OEE’s website within 24 hours. I hope the CBC story is wrong, of course, and that this is all just coincidence. Just like any other Canadian, I want to believe that my government bases its recommendations to Canadians on sound science exclusively. Just imagine if Health Canada took its directives from the pharmaceutical industry. But I have to admit I’m concerned that in this case real science may have been trumped by other interests. In the meantime, since the 10-second rule remains valid in other countries, I think it’s too early to give up on it here. If you believe our environment is worth preserving, it’s still a good idea to minimize idling and avoid drive-thrus. Carl Duivenvoorden http://www.changeyourcorner.com is one of 22 Atlantic Canadians trained by Al Gore to deliver presentations of ‘An Inconvenient Truth.’ He lives in Upper Kingsclear. His column runs every other Monday.